We like frequent renter clubs because they are generally free to join and deliver real benefits, such as letting you skip the rental car counter or earn credits toward free rental days or both. But sometimes it' can be a hassle to chase the best car rental rate and also chase down loyalty program points. It's straightforward when you book through a rental car company. But what happens when you book a rental car through on online booking site such as Priceline? Luckily, in most cases, you can still make your booking count toward your frequent renter points. Priceline no longer offers opaque "Name Your Own Price" rental car bookings. Now when you ask Autoslash for a quote on a cheap car rental, we'll send you discounted rates that may come from rental car companies or possibly from Priceline. Simply choose the "Free Cancellation" / "Pay Later" rate that matches the discounted rates we send. You should enter your loyalty programs on the same screen as you enter other reservation details, right before you confirm the reservation. Rebook and hope the discounted rate is still available: If you forget to add the frequent renter number in advance, you can make a revision to the reservation just like making any other change such as dates, times, locations, and so on. The only way to add or edit any information after a booking is completed is to *make a new reservation* (editing a reservation creates a new one). Take care of it at the rental car counter: If your booking is complete, you can also have the rental car agent add your number when you pick up the car. This is a bummer if you were otherwise going to skip the rental car counter line. Entering your loyalty number when you book through Priceline is simple. Priceline provides an option to enter add-ons on the same screen where a renter has to enter renter details. Just read and accept the rules and submit the reservation. If you are eligible to accrue frequent renter benefits with the rental car company, there will be an option to enter the frequent renter number. The add-ons dropdown brings you to a menu where you can enter your account info. A few rental car companies don't allow you to earn frequent renter benefits when you book through external websites. These companies—predominantly discounters—have adopted the stance that a renter must book directly through the company to accrue points. This tactic is intended to drive renters to book directly through the company's own website. 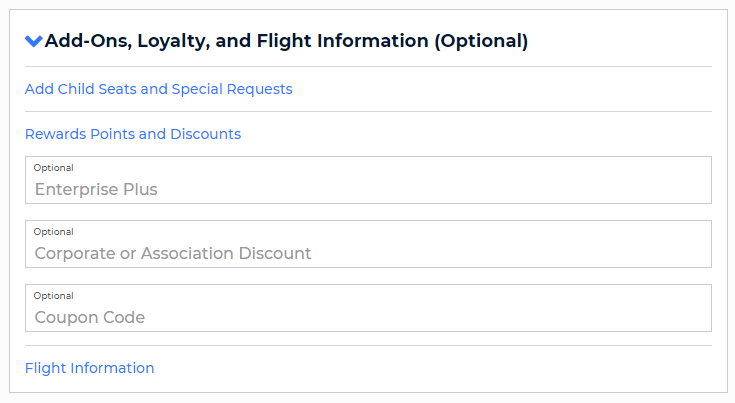 If you're booking on Priceline and select a discounter that doesn't extend benefits for external bookings, the site will block you from entering a frequent renter number. There simply won't be an option. Just remember: Even when booking through a third-party site, loyal renters can still take advantage of program benefits so long as you add your membership number to the reservation or take care of it at the rental counter when you pick up the car.